Poplar trees and tablets. Thinking about engagement. We don’t mind. The kids, all in their 20’s, are ready to learn from us. They now want to know about buying tires, making jam, and planting trees. Last week, on December 24th actually, the project was to take down an old poplar in the back of the property. Tricky business taking down a 60 foot tree. But this kind of project is exactly the type that gets everyone ramped-up. There are calculations to be done, and re-done, and theories regarding the falling tree’s trajectory to be hashed out (and then bet upon). Oh what fun! 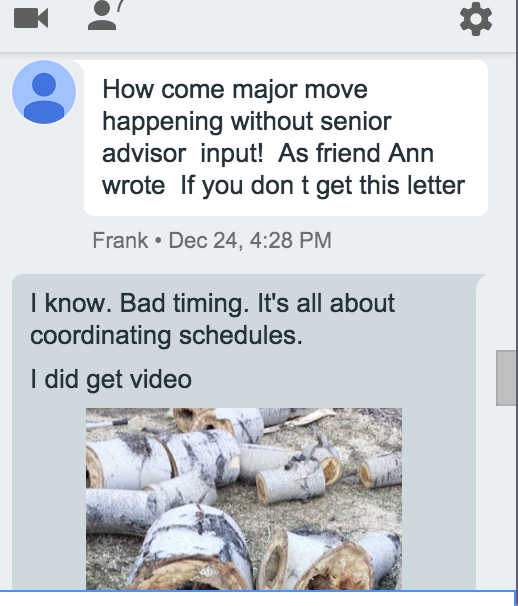 My job is to document the process, and I did by snapping pics and posting them to the family Google hangout. And then an unexpected message appeared. Last year for Christmas, I got my 85 year old father a tablet. Learning to use it has been a slow process. He doesn’t have a smart phone (yet), so everything is new for him. Each time he comes for a visit, he learns or relearns one thing. This fall he began to attend a class to learn more about how to use the tablet. And he joined the family hangout. This was always the goal. The family chat is lively with lots of pictures shared. It is one way we stay connected, and I knew that beyond appreciating the conversations, he too would be more connected to all of us. He never chatted with us though, preferring to ‘listen in’. 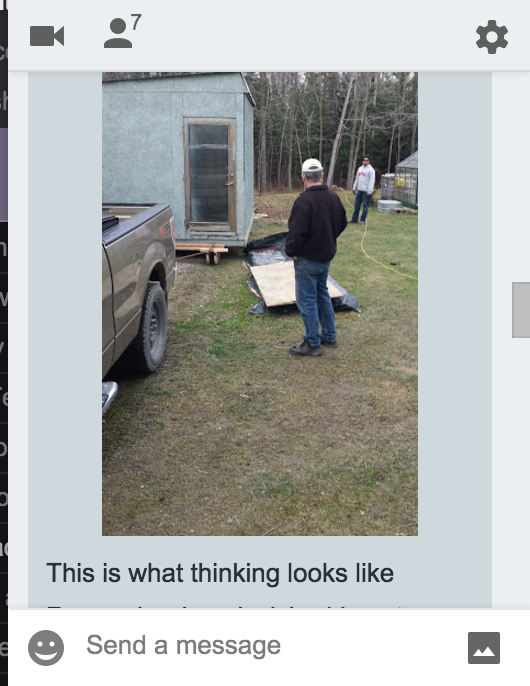 Last week when my dad saw what we were doing, he was intensely jealous. He wanted to be there with us to be part of the excitement. In fact, he was so engaged in the event that he overcame his fear of texting, of doing something wrong, of looking silly in a public space, and he typed out his disappointment and admonishment. How come major move happening without senior advisor? This story is a terrific example of what engagement can look like at the various stages of learning. Clearly, my dad was motivated to learn how to use the tablet. He persisted in his learning even though he didn’t always have a teacher. He sought out direct instruction and he practiced. As his confidence grew, he showed a willingness to join the hangout and then to participate in it. Engaging our learners is not about entertaining them. It’s not about making things easier. It’s not about doing everything for them. It’s not about how much fun they’re having. Rather, student engagement is his or her intellectual commitment to learning. It is building the skills and knowledge needed to make that leap, conduct that inquiry, or create that project. It is the day to day, week to week, month to month learning that makes taking that risk possible. I’d love to hear your observations about learner engagement. My word is INNOVATE. But this choice has little to do with technology directly and more to do with thinking about using the curriculum in innovative ways. I want to challenge my understanding, my perspectives, my biases about the curriculum. What does it mean to construct meaning? Communicate meaning? What about to generate, gather, and organize ideas and information? What changes, if anything, when literacies include digital literacies? How might English as a discipline need to be reconsidered? What I avoided in that initial post was answering the question why? Why innovate? And why did I choose a word that is so closely tied with technology, but not focus on the integration of technology in teaching and learning that is at the centre of so much of the educational conversation today? I’m an English teacher, and I am not a particularly geeky English teacher either. Like most English teachers, I believe English class offers students the opportunity to engage with and consider deeply the big ideas of our lives through the stories we read. Narratives provide a lens to the world that we may otherwise never access, and that lens helps us to understand each other, which is more important today than ever before. So the study of the narrative structure and stories, which in fact, is all the Ontario English Curriculum asks us to do (“read a variety of texts”) is not the problem. Academic students* are bright, curious, and creative, but that doesn’t mean that they want to read Nineteen Eighty-Four and write an essay. And yet, is there any doubt that the majority of instructors and professors in post-secondary do still require traditional demonstrations of learning from their students? While I believe that students need to be able to write at length to explore their thinking, I also believe that students must be fluent in digital literacies, so that they can be critical consumers and purposeful creators of digital texts. This, then, is the current and pressing challenge for the discipline. We can neither abandon the old wholesale nor adopt the new only. We need to innovate: To find novel solutions to this important problem. 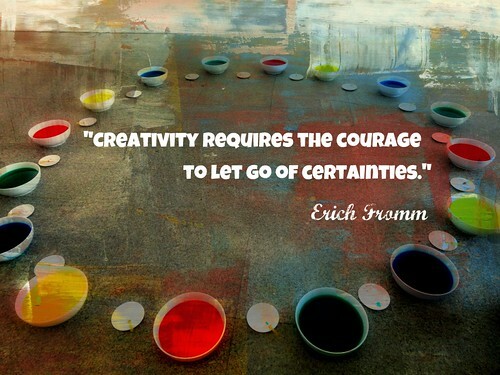 I let go of many of my certainties: whole class novel studies, literature circles, and lessons from the past. Instead, we choose our own novels to read, we considered various critical perspectives in small groups using the Question Formulation Technique, and we looked for new ways to have conversations about a book that no one else in the class was reading (via Goodreads, for example). In the academic class, we collaborated to create a Mindomo map on literary theory, designed personal poetry anthologies, and blogged to think out loud about our learning. In the college class, we considered how our worldview impacts the decisions we make, which led us into an inquiry on ethics. Students’ contributed their thinking (aka research reports) to our on-going wiki textbook: Global Perspectives: A Textbook for Teens by Teens. I pushed myself to push the students to own their learning, to be the designers of it. There was choice in text, in topic, in theme, in approach. We worked on learning to be learners. Innovation in learning is a process of self-discovery. It’s looking for unique ways to solve the problem of making the learning our own. It’s a journey to yes. *Although here I am writing about students who will pursue academic studies beyond high school, I do not think that this conversation is just about them. Students who choose to enter into apprenticeships or directly into the workplace also need many of the same literacy skills. Will Richardson often thinks out loud about how we need to be getting our students ready for a world in which they will work project to project as freelancers or contract employees. His most recent post is no exception, and I couldn’t agree more. i hate writing bios. i’m mikaela and i like to dance. i want to create choreography that speaks to issues that affect people. issues around politics, the environment, equity and our emotional well being. i want to create dance that is geared towards stage performances, site specific live performances and for video. i want to expand the dance audience, moving dance from the club or a unit in your grade 8 gym class into a common element in people’s lives. that being said, i love art. i pay for the music i listen to. i frequent shows of all types. i also delve into the craft world, venture into food, fashion, design- essentially, self expression. i love dogs. i am from Manitoulin Island. my favourite kitchen utensil is the spatula (spatula, not a flipper). i’ve only had one hair dresser my entire life, she’s amazing. i like sports, playing more than watching. i’m a mutt. i’m practical. and i always seem to be working three jobs. All manner of jobs. Some have been related to her passions. Some have been independent ventures. Some are required to help pay the bills. She is currently a server, a gardener, a freelance dancer, and an entrepreneur. This is the way it is, which makes the question valid: Are we preparing students for this life? Many educators are moving toward inquiry or problem/project based learning to connect students’ in school and out-of-school experiences, interests, and skills, and to engage students in the process of learning. Richardson suggests, however, that problem/project based learning isn’t enough. Students have to work in flexible, fluid teams, collaborating and adapting as they find solutions and then tackle new problems. They need to be working on projects they care about, projects that have a real purpose in the world. And he cites NuVu School as an example of a school that is pushing the boundaries of what school might look like. NuVu School is exceptional. Its ‘coaches’ are highly specialized, the ‘studios’ are equipped with all the resources and materials to actually prototype designs and try them out, and the class ratio is 6:1. I think it means that students who go to NuVu can afford to go, which speaks to their socio-economic background and from that we can infer that they have supportive family, access to resources, and freedom from the distraction of poverty. This is not likely the reality for many students–or teachers. I am, for instance, not qualified to teach at a school like NuVu. So what does this mean? What is the goal then? What can I reasonably take on? I think it means that we need to learn from students like Mikaela. How did she cross the threshold from a school system designed to produce 20th century adults to her current reality–the current reality? I believe she is able to negotiate this crossing-over because she is learning ready. She can read and write well, she speaks and listens well, and she is open-minded, flexible, resilient, independent, confident, and hard-working. She didn’t leave high school knowing how to blog or produce a dance film. She had no experience in project based-learning. And yet here she is doing all of that and more. I can’t create a NuVu studio in my classroom, but I can work toward getting my students ready for that threshold. This is very hard work. Project-based or inquiry learning relies on prior knowledge both in content and in skills. My students don’t always have either. Students in poor jurisdictions with high levels of poverty suffer academically from the get go. They enter school behind their better-off peers and rarely catch-up. Something will be missing. Maybe they’re not reading well enough to do the kind of research that independent PBL or student inquiry demands, or not reading well enough to have experienced the world vicariously, and so students struggle to identify individual passions or burning desires. Maybe they are aware that their written work is lacking, so students are reluctant to share it with a global audience. This lack of confidence impedes collaboration of any kind which is at the heart of all inquiry/PBL/PBW. Many of my students, say 50%, will not talk in class. They will not ask a question, make a comment, contribute to small group conversation, or make a presentation. I am stubborn and persistent, and I have high expectations for my students, so we will push through all the above. But the focus is not on PBL per se. Yes, there are learning opportunities that can be called inquiries: students strive to generate their own rich questions; we work in a blended learning environment; and student choice is embedded in many of the learning events. My main goal is to teach my students how to learn. I want them to know how to be flexible in how they might learn, how to access the resilience needed when the learning gets hard, how to stretch their peripheral vision to include ways of knowing that are not yet familiar, and how to be not just reflective, but metacognitive. If this, then, is a learning ready stance, and if we can learn anything from the story of one student, then learning ready is beginning to look like the state one needs to be in to learn how to do Project Based Work. And that is an achievable goal. #cyberpd holds a very special place in my heart because it is the event that first got me connected digitally (in a significant way) back in 2012. I couldn’t participate last year because I was in courses all summer and living on the road, but I am happy to be back! I teach high school English and this year my stack of TBRs are all works of fiction. I am fortunate to have a supportive Principal who has helped me build a new and substantial class room library, and my goal this summer is to read as many of the titles as I can. But professional reading is important to me, and I am hoping that #cyberpd offers me that one must read title for this summer as it has with Who owns the learning? and Opening Minds: Using Language to Change Lives. 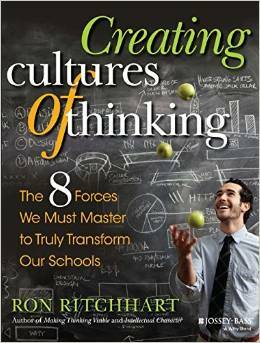 I am very compelled by the buzz around Creating a Culture of Thinking: The 8 Forces We Must Master to Truly Transform Our Schools by Ron Ritchhart. I have learned so much from Ritchhart’s Making Thinking Visible as it has supported my professional work on learning how to engage students in questioning. The biggest challenge is that students don’t think. They have been trained to sit back and wait to be told what to do, and at best, to answer teacher questions. Generating their questions, questions that haunt them, that must be answered is a tough sell. But I am an optimist and truly believe that by creating a real professional learning community the culture of a school can be reshaped into one where personal inquiry, and thus, deep, meaningful learning, can happen. It feels good to be a member of a culture of thinking. It produces energy. It builds community. It allows us to reach our potential. This is something we as educators need to remember. A culture of thinking is not about a particular set of practices or a general expectation that people should be involved in thinking. A culture of thinking produces the feelings, energy, and even joy that can propel learning forward and motivate us to do what at times can be hard and challenging mental work. Not only is this passage inspiring, it also describes for me the very essence of the #cyberpd community. Creating Cultures of Thinking is my nomination for #cyberpd 2015. I grew up in a place and at a time when communication beyond face-to-face interaction was limited to the phone. Long distance calling was exorbitantly expensive and so, rarely done. It was hard to imagine being an ocean biologist when the nearest ocean was a thousand miles away. It was hard to believe that you could do anything other what you saw in front of you, and most of the time, there was simply nothing there. 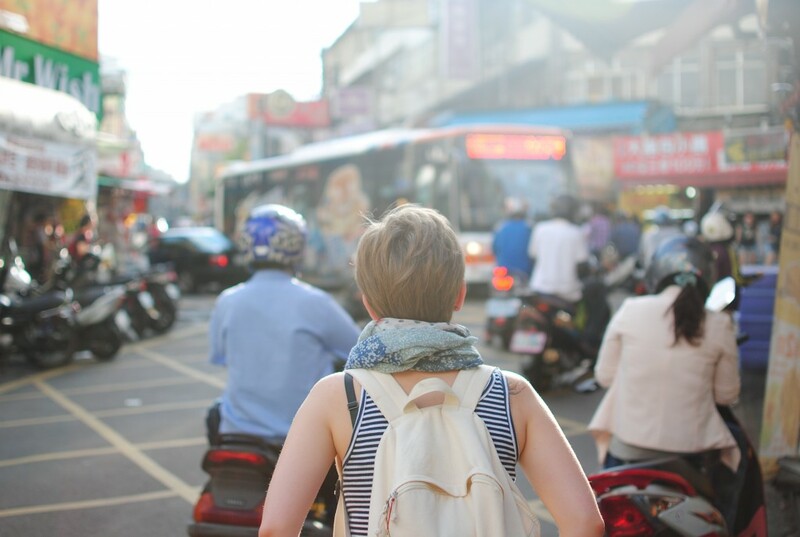 I still live on the edge of the populated spaces in this country where there are no traffic lights, no stores open for evening shopping, and no line-ups for…well, anything. Waiting in traffic means someone is helping that turtle trying to get to the other side or a family of raccoons have decided to cross the road. And yet I don’t have to live on the periphery of intellectual spaces any longer. I can participate in the most current educational thinking of Ontario, Canada, and beyond. I don’t have to wait for someone else to decide what is important for me to know about teaching and learning. I don’t have to hope that someone will provide me with inspiration for my work. I don’t have to draw on only the local resources to design courses that are meaningful, relevant, and intellectually engaging for my students. What this does mean; however, is that others in my situation don’t have to either. This has been the challenge, then the difficulty, and now the problem facing me of the past five years. Why are the educators around me not embracing the opportunities offered via the current technologies to grow and learn past where they are physically located? Why rely on Nelson or Pearson solely to teach their students? Why do they think that what they have always done is sufficient today? This brings me to this…..
And Donna Fry’s blog is a source of inspiration for me. 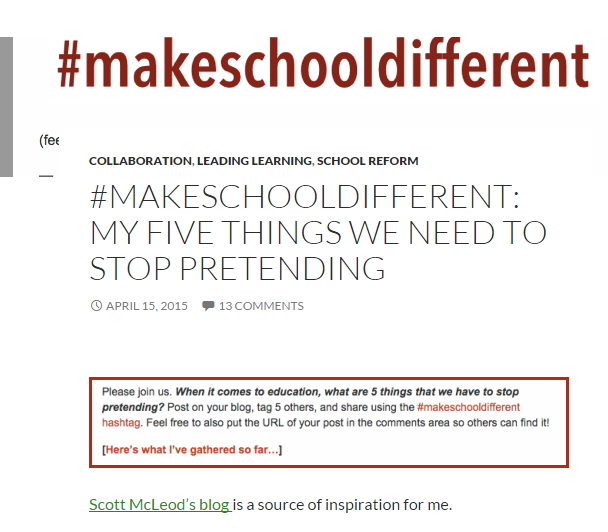 She tagged me in this post where she enumerates the 5 things that she thinks we need to stop pretending in order to #makeschooldifferent. #1. We need to stop pretending that teachers can do this job alone. We need to recognize that planning time cannot mean that teachers work in isolation; nor can it only mean planning across grade teams. It must also mean having time to connect with educators beyond our four walls. It means growing our PLN. It means honouring social media connection time as valuable. #2. We need to stop pretending that all educators are de facto good learners. Tom Whitby has said, “To be better educators, we must first have to be better learners.” Agreed. And this does mean all of us who claim the title of educator: ECE, EA, Teacher, Coach, Consultant, Coordinator, Principal, Supervisor, Education Officer, Program Manager etc. We all need to expect of ourselves first what we expect of our students…to be risk-takers, metacognitive, and ‘learning ready’. #3. We need to stop pretending that someone else is going to do the work. All educators at every level of our education system must engage in the actual work with students. The days of “walk-throughs” by administration need to end. 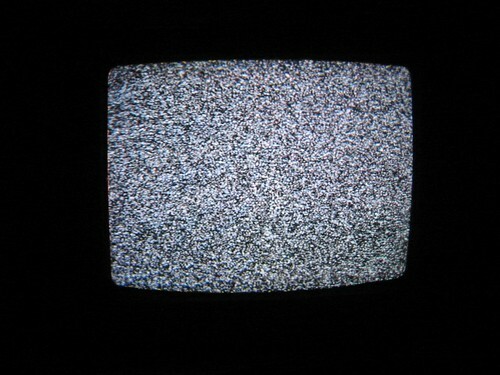 Rather, administration needs to work in the classroom to remain connected to the ever-changing demands of the teaching-learning exchange. Instructional rounds conducted by teachers and administration have taken hold in some places and work because they support/model a culture of ongoing learning. I have to believe that that culture is passed on to and/or picked up by the students, too. There are other examples that demonstrate the importance/value of everyone doing the work. You can see here the Northern Ontario eLCs working with teachers and students of the Hamilton-Wentworth District School Board and the Trillium Lakelands District School Board. Another example comes from a session I attended for preparation work for a new e-learning course where Lori Stryker from the Assessment Branch of the Ontario Ministry of Education spoke about her work with teachers and students in classrooms to ensure that the work does not live in the theoretical realm, but moves always to practice. #4. We have to stop pretending that learning is about isolated subjects driven by content. We need to design learning to be interdisciplinary so that students and teachers can tackle real world needs. This might mean solving real problems like how a school can acquire a new field for outdoor learning and recreation/training, or it might mean developing a program that responds to students’ desire to learn about the traditional life of their people (much like the Specialist High School Major program in Ontario does). We need to see this kind of learning become the norm. Frankly, it is becoming more and more difficult to explain to high school students why they need four English credits. They don’t dispute needing to develop and strengthen their communication/literacy skills, but many of them would rather do that work via robotics, student council, or a music business course. #5. We have to stop pretending that only some teachers are teachers of literacy. Everyone needs to be able to speak, read, write, and create really well. Literacy is the set of skills that drives all other content–regardless of discipline. Literacy instruction needs to be built into every part of a students’ day because it is a set of skills that was, is, and will always be needed. Advanced literacy skills ensure that students will be able to think critically, communicate persuasively, and work collaboratively. In Ontario, the work of incorporating/embedding literacy into every grade 7-12 classroom is supported by the Adolescent Literacy Guide and the folks at the Curriculum Services Branch of the Ministry of Education. It’s up to our school and system leaders to make sure that every teacher is skilled at literacy instruction. Of course, there are more than 5 things to stop pretending. Here are some other voices who have expressed ideas that I would add to my list too!!! And I would like to challenge my English teacher colleagues @msjweir, @arachnemom, @sarle83, and @danikatipping. Looking forward to hearing your thoughts ladies!!! What one word captures your work, your learning, your focus for 2014? After all is said and done, what one word synthesizes your thinking of the past 12 months? What one word caught your attention and distracted you every time you heard it? 2014 is the year I worked on my Principal Qualifying Program part 1 and 2 courses. Predictably, we were asked to list our top beliefs that would guide us in our leadership. EQUITY emerged as #2 on my list (#1 being honesty and #3 being collaboration). Equity for students, for families, for all staff is desirable, of course, but it’s not always easy to attain. Everyone has ideas about what should happen in a school–from access to technology to class room resources to experiential learning opportunities–and many can make very convincing arguments as to why their ideas should be put into action. And many still confuse an idea of fairness with that of equity. But with a strong conviction around student learning, I think that true equity can be attained and maintained. You want to teach a ______course? You think we should spend money on_________? Tell me how it’s best for students? So a lot of great words have been chosen for 2015…. @Glennr1809 has a few: balance, serving, network, vision, network. Check it out here. @avivaloca chose being uncomfortable. Check it out here. @Dunlop_Sue chose change. Check it out here. @fryed chose courage. Check it out here. UPDATE!!! There is some desire to create a Word Cloud of Ontario Educators’ one words. Tweet out your one word for 2015 to #onewordONT.